GALDAR® (Letrozole) is used for different therapeutic applications including: a) adjuvant treatment of postmenopausal women with hormone receptor positive invasive early breast cancer; b) Extended adjuvant treatment of hormone­dependent invasive breast cancer in postmenopausal women who have received prior standard adjuvant tamoxifen therapy for 5 years; c) First line treatment in postmenopausal women with hormone dependent advanced breast cancer; d) Advanced breast cancer after relapse or disease progression, in women with natural or artificially induced postmenopausal endocrine status, who have previously been treated with antiestrogens; e) Neo­adjuvant treatment of postmenopausal women with hormone receptor positive, HER­2 negative breast cancer where chemotherapy is not suitable and immediate surgery not indicated. Efficacy has not been demonstrated in patients with hormone receptor negative breast cancer. Letrozole is a non­steroidal aromatase inhibitor. It inhibits the aromatase enzyme by competitively binding to the harem of the aromatase cytochrome P450, resulting in a reduction of estrogen biosynthesis in all tissues where present. 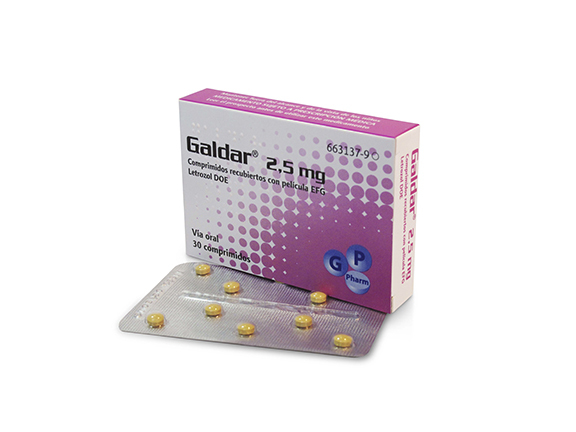 GALDAR® is presented in tablets of 2.5mg in packs of 30 tablets.